Capturing 14 years in the lives of two families fervently committed to their sons’ academic success, American Promise reveals that for black boys, educational opportunity is just the first step. Filmmakers Michèle Stephenson and Joe Brewster knew they wanted their film to contribute to closing the black male achievement gap — but how? Active Voice got involved early on to create a strategic roadmap for the campaign. After an intensive strategic planning phase, Active Voice identified target audiences, clear campaign goals, priority partners, and campaign framing, as well as a logic model detailing how short-term outcomes from campaign activities could contribute to long-term structural change. Acknowledging the need for a version that lifts up the experiences of the young men featured in the film, Active Voice also conceptualized and co-produced a 26-minute video module that continues to be used in youth trainings nationwide. Watch the video module Behind Every Promise. 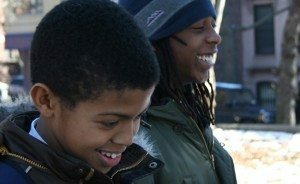 The "Behind Every Promise" Discussion Guide is intended to help young black men (between the ages of 14 and 22) use “Behind Every Promise” as a springboard for exploring issues around identity and life experience, ultimately inspiring a sense of agency toward developing support systems for success. "Behind Every Promise" takes a behind-the-scenes look at American Promise, supplementing the film with newly shot video testimonials from Idris Brewster and Seun Summers, in a retrospective that offers viewers a chance to walk in their shoes as they navigate the emotional ups and downs of school, friendship, and family.